Sometimes it’s the silence that worries the parents…the times when their kids just don’t open up about even the smallest things. Have you ever asked your kids about their day and all they responded was ‘Fine’. At times, it’s irritating because you just keep wondering what went wrong, how can you make them talk and what is the way by which they can open up about anything they are comfortable with. Ask Open-Ended Questions: A question that does not have a 1 word answer is good!! The top most rule you learn in any communication is to keep the discussion going on by using open ended questions. These kinds of questions prompt answers that add a lot to the conversation and engage your kids too. Rather than asking a straight question like “How was your day?”, try to dig deep into what really happened with your kid; Whether they enjoyed or not, get some information about a friend your kid typically plays with, a project that they are part of or their favourite class. If you do not listen actively, chances are that the conversation will do no good to you or your kids. It will be merely like passing by an acquaintance on the street and smiling. Make sure to listen to your kid’s answer and actively respond to show that you’re interested in what they are saying. For eg. If your kid says that they went to the school farm or field trip, then ask them about what they saw, liked, learned or played with!! This shows your kid that you are listening and paying individual attention to them. Communication is a two way process. If you don’t open up to your kids about the little things that are shareable to promote healthy communication, they won’t do it either. You need to model the type of behaviour that you are expecting from them. Just talk over the dinner table where everyone can listen to each other and engage. Ask each other about their day and let things flow. Knowing that the family gathered at dinner is a safe place to share joys and disappointments, is comforting. What was your favorite part about school today? What activity did you like the most and the least today? What did you think of the first assignment you had to do today? If you could do any moment at school over today, what would it look like? What was the funniest thing that happened in your class today? Which assignment/activity did you feel most confident about today? How is it going with your school activities and assignments? What’s the most interesting thing you heard at school today? What made you laugh/worry/smile in school today? Use these ways as a conversation-starter and make the most out of your family time…. …And if you want to enroll your kids in activities where they can socialise, then be sure to contact us. 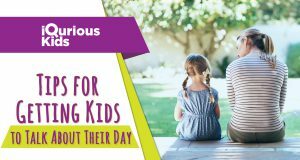 Next article Mother’s day gift ideas for kids that they can make easily.